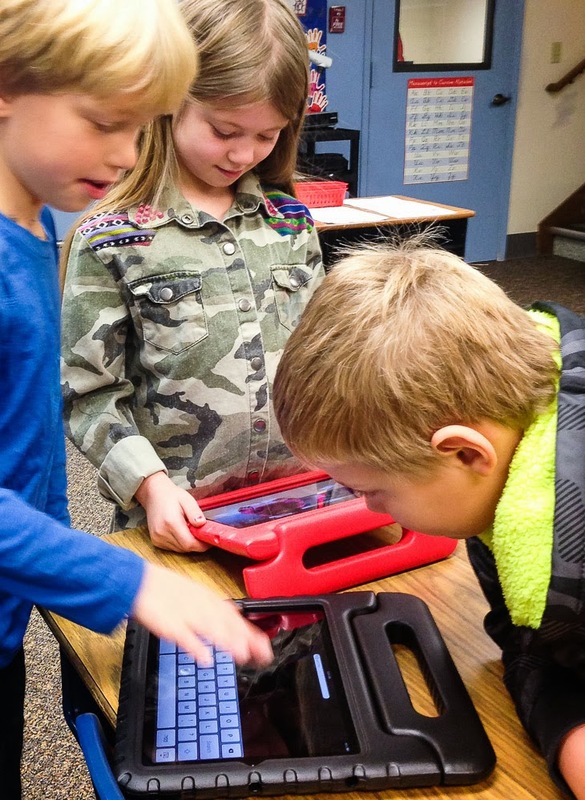 Take a look around Seabury School and you will notice students of all ages, from prekindergarten through middle school, engaging with technology in new ways every day. Students use technology as a tool – much like their parents do at work and home – for finding information, keeping track of work and deadlines, creating presentations and much more. 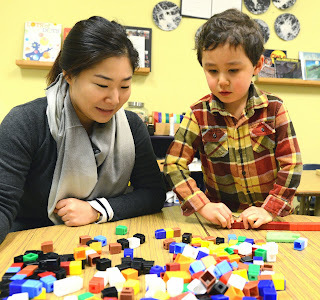 Just last week, I had the chance to spend time with our first and second grade students who were on a “math adventure,” trying to figure out how puzzle pieces of various shapes might fit together and looking for patterns they might discover in the process. They used iPads to take pictures of their problem solving along the way, and recorded short videos of their findings to share with the class later. Our prekindergarten and kindergarten students practiced phonics skills with games on the Smart Board in their classroom. 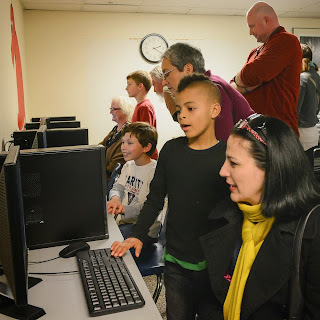 Third, fourth and fifth grade students did PowerPoint presentations for their families as a culmination of their study of the origins of life and evolution, showing how imaginary creatures the students created evolved through geologic time and either made it to modern times or died out. Our library’s new database allows students to browse the catalog from home over the Internet, including reserving books and making reading recommendations to other Seabury friends. 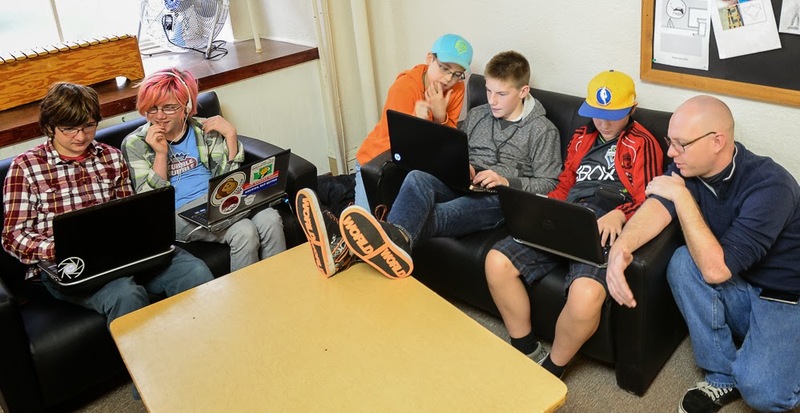 Our middle school program is a laptop-based program, and students use their computers for everything from research to writing papers to video editing to programming. They use technology tools to assist their learning as they will throughout their lives – keeping track of homework using tools such as Google or Outlook calendars, collaborating through Edmodo, and using a wide range of open source technology tools as they put together independent technology projects that range from a book review blog to a fashion magazine to a video game to an animated movie to a website for displaying and selling original artwork. 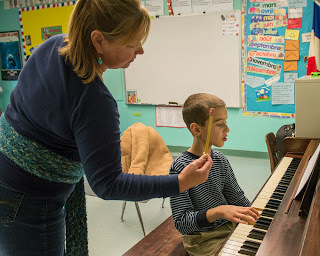 Other schools might have fancier equipment, but it often sits in a lab and is only used during “technology time.” At Seabury, our faculty has integrated the use of technology throughout the curriculum in ways that are opening the doors for learning and supporting student engagement and exploration across grade levels and across the curriculum. Skype allows students in the classroom to have real time conversations with those who might physically be on the other side of the world. Students keep track of their work and plan ahead using the same tools their parents use at work and home. They learn how to use the Internet as a resource, including how to make sure sources are reliable and valid. Technology has not and will not replace discussion and play and building models and other forms of learning at Seabury. Instead, it opens doors to deepen discussions, inform play, and inspire creation and imagination. "We are currently preparing students for jobs that don't even exist, using technologies that haven't been invented, to solve problems we don't even know are problems yet." By providing a program that emphasizes problem finding and solving, using information in novel ways, analyzing and synthesizing information, and using technology as a tool to open up the world to our students, Seabury is preparing our students to live and thrive in this quickly changing world. Technology at Seabury isn’t about having the fanciest tools (although they are surely fun! 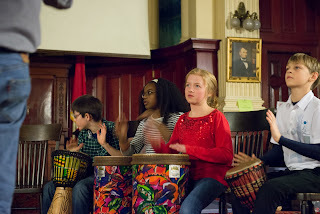 ), it's about thinking flexibly, accessing information, and using resources to help engage with big ideas. If you haven’t visited lately, stop by and let us show you how technology supports learning and growing at Seabury. Seabury has had the privilege this week of hosting representatives from Korea Poly School, an English language institute based in Seoul, South Korea. The group was led by the company’s founder and CEO, Mr. Sung Won Kim. He was joined by Mrs. Kim and daughter, Sue, a Ph.D. candidate in education at the University of Minnesota, Mr. Alex Im, chief executive director, and Ms. Jane Rhee, executive director of research and development. They spent time talking with teachers, observing classes, and meeting with members of Seabury’s staff and board. It was exciting to see Seabury through the eyes of our visitors. Education at Seabury looks much different than what our guests have experienced in South Korea. They loved seeing our students engaged in discovering and exploring, asking as well as answering questions, problem finding and solving, and digging deeply into learning. Sue Kim remarked that learning at Seabury is like what she is doing in her graduate school program – being presented with general information, forming her own questions for investigation, researching and finding answers, presenting her findings and then having her research evaluated by her peers and instructors. What an apt description of the process that takes place every day in every Seabury classroom, from pre-k through grade eight. We are thrilled to have hosted our Korean friends, and to give them a chance to see our students and faculty shine! New pencils, crayons and laptops. New clothes and teachers and friends. It must be back to school time at Seabury. We have had an incredible opening week of school. Classrooms are beautiful and inviting, students are engaged and digging in. As you will see in our classroom blogs, there is a sense of excitement and wonder in all our classrooms as students and teachers get the 2013-2014 school year off and running. We welcomed 22 new students and their families this year, including four new middle school students and eight new pre-k students. Ms. Head, with assistance from Ms. Jackie, have a completely full Serpents’ class, and there are several nearly full classes at the lower school. Eight new sixth grade students joined our seventh and seventh graders to form the largest middle school group yet. And, we are talking with several families who may be joining us in the coming weeks. Students are getting to know their teachers, setting goals for the year, making new friends and reconnecting with old friends. It has been a fun, exhausting, exhilarating week! It's going to be an amazing year at Seabury, and we couldn't be happier to have you and your family along for the ride!